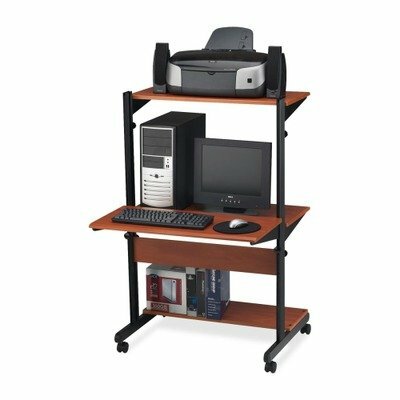 Holds monitor, keyboard, printer, CPU and peripherals in seven square feet Three 32w x 15d shelves support up to 100 lbs. eachholds monitor up to 21amp;quot;. Simply twist knob to adjust shelves 14amp;quot; to 48amp;quot; high for sitting or standing. Fixed 31w x 12d bottom shelf. Overall Width: 32amp;quot; Overall Depth: 31amp;quot; Overall Height: 50amp;quot; Colors: Medium Cherry/Black. Medium Oak Mobile Computer Cart Dimensions: 37.5"W x 19.5"D x 30.5"H Weight: 145 lbs.